Liberty Lake, Wash. and Silver Spring, Md. 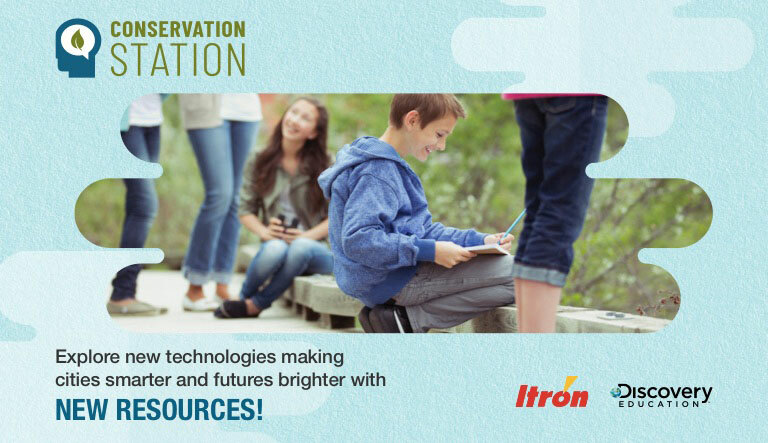 (Monday, October 8, 2018) – Itron, Inc., which is innovating the way utilities and cities use energy and water, and Discovery Education, the leading provider of digital content and professional development for K-12 classrooms, today announced Conservation Station: Creating a More Resourceful World – a new initiative developed to engage and educate middle school students on the relationship between energy and water through the lens of conservation. Designed to provide access to digitally immersive and educational experiences, this inaugural Smart Cities Virtual Field Trip will premiere LIVE from Itron’s Innovation Center in San Jose, Calif. on Tuesday, October 9, 2018 at 1:00 p.m. ET/10:00 a.m. PT. Students, educators, parents, school communities are invited to register for the event at learntoconserve.com. Also, participants are encouraged to join @DiscoveryEd, @ItronInc and other experts for a LIVE Twitter chat by submitting questions ahead of time using #SmartCitiesVFT. The Smart Cities Virtual Field Trip will transport students beyond the walls of their schools and learning centers for a behind the scenes tour of Itron’s Innovation Center, where they will learn about what makes a city smart and how sustainable communities play an essential role in conservation. Students will also learn the relationship between energy and water, including how innovative urban technologies are solving today’s conservation challenges. The Smart Cities Virtual Field Trip will visually connect for students how technology is helping protect sea turtles in Florida, while restoring power outages that may be caused by local lightning storms. Conservation Station: Creating a More Resourceful World aims to encourage a national dialogue on the importance of students’ understanding of current and future energy needs, resource utilization and conservation. The program material dives into the relationship between energy and water and how innovative technologies are working to conserve both resources through the core pillars of resourcefulness: effectiveness, efficiency and sustainability. During the spring of 2019, Itron and Discovery Education will launch the first annual Week of Resourcefulness, which will provide educators with a brand-new STEM investigation activity every day of the week. Each guide will be designed for teacher-directed, activity-based learning and will explore unexpected connections at the heart of the energy-water nexus. The initiative will provide accompanying take-home companion guides for students to continue learning outside the classroom. Conservation Station: Creating a More Resourceful World will also become available through Discovery Education Streaming Plus. For more information about Discovery Education’s digital content and professional development services, visit discoveryeducation.com. Stay connected with Discovery Education on Facebook, Twitter, Instagram and Pinterest @DiscoveryEd. Itron enables utilities and cities to safely, securely and reliably deliver critical infrastructure services to communities in more than 100 countries. Our portfolio of smart networks, software, services, meters and sensors helps our customers better manage electricity, gas and water resources for the people they serve. By working with our customers to ensure their success, we help improve the quality of life, ensure the safety and promote the well-being of millions of people around the globe. Itron is dedicated to creating a more resourceful world. Join us: www.itron.com. Itron® is a registered trademark of Itron, Inc. All third-party trademarks are property of their respective owners and any usage herein does not suggest or imply any relationship between Itron and the third party unless expressly stated.